Thinking you need a cool way to display testimonials on your website? Try to not copy these ten awesome examples! Consumers have an infinite source of options for their every need online. For designers, this represents a massive opportunity to expand their client base by attracting new customers via the internet. Just about every designer can tell you, however, that it’s not quite that simple. The fight to been seen above the sea of available designers is one thing. Closing the deal for a project, on the other hand, is something else altogether. For a potential client to make the decision to hire a designer, a great deal of trust comes into play. Presenting your work in the form of a portfolio is good, but it’s often not enough. After all, design skills aren’t the only thing that makes for a great professional. How easily can you work with your clients? What’s your take on customer relationship? These are small things that end up having a huge impact on the buyer’s decision. This doesn’t mean that the client needs to feel like they can trust you with their health, but you will be in charge of crucial elements in their company – so they need to feel like you have the necessary skills so handle the job. And in establishing that sort of trust, very few tools come in as handy as testimonials. What are testimonials and why do you need them? A testimonial is a statement from a previous or current client in which they share their opinions of your service. Fairly simple, right? Testimonials are very similar to the customer reviews we are all used to seeing on websites like Amazon, and they are absolutely necessary for the same reason Amazon encourages reviews. People need a reason to trust you, trust your expertise and character. BrightLocal’s consumer behaviour report (2017) found that of all people who participated in the study, only about 3% said they don’t trust online reviews. In comparison, about 85% of them said they trust reviews like a personal recommendation – it’s true, these numbers refer to retail but they do speak to the mind of internet users everywhere. People need opinions and reviews from other consumers to establish trust. At 85%, this percentage of internet users is too high to be dismissed it as irrelevant. Instead, how about looking for awesome ways to display a few testimonials on your website and see how these affect the behaviour of your visitors? Check out these awesome testimonial examples, and try to resist the urge to outright steal them (it’s only natural). Let’s take a look at some testimonial examples that were done right. Let’s start with a testimonial example that is located right on the homepage. 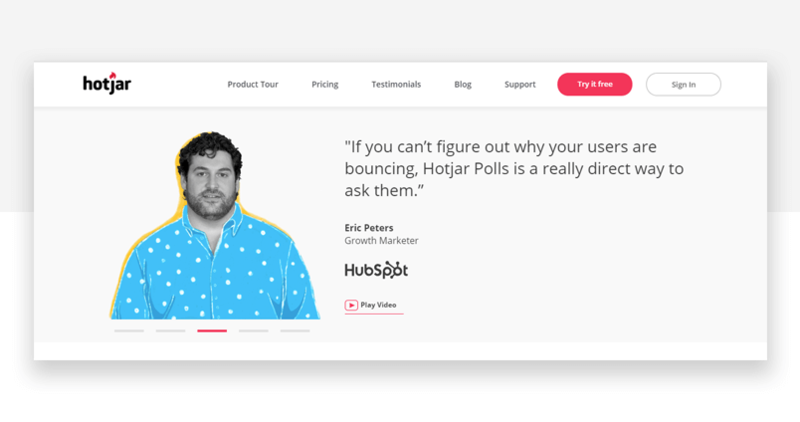 In a banner that changes among five testimonials from different customers, Hotjar’s testimonials are a lesson in testimonial presentation and general design. With a touch of creativity in the presentation of the client’s picture, we can all appreciate the brand identity shining through this simple design. The brief testimonial is already enough to catch the eye, but those who are intrigued or curious are free to follow the small button to watch a full interview with the client that works as a case study. More and more, people are placing more importance on video testimonials as they are an easy way to add emotionality to your testimonial as opposed to a few lines listed on your webpage. Note that all the testimonial examples in video form are short – not one of the five testimonial examples surpass the two-minute mark. Even with a video that brings the visitor into the story, lingering too long will lead to loss of interest. 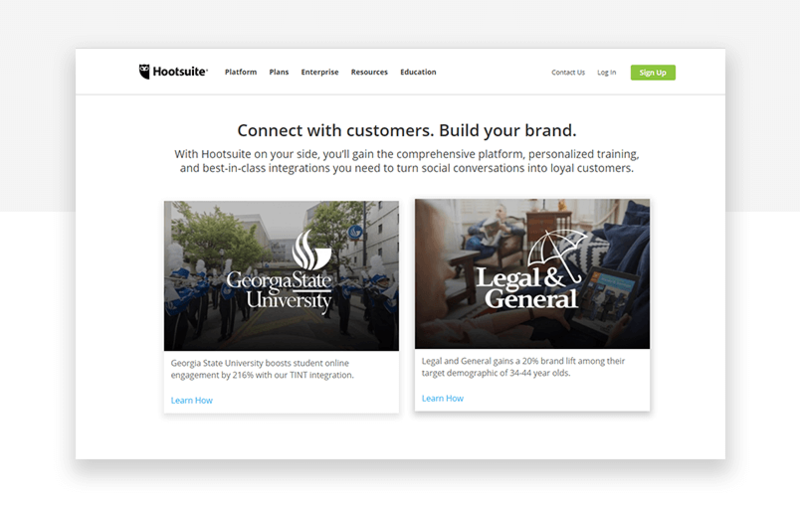 Here’s why we love Hootsuite as a testimonial example: its design dissected the testimonial page into three different sections – one for each of the three big reasons to use their services. These reasons are brand building, social media management efficiency and revenue growth. Hootsuite rose to the challenge by listing out known brands that offer the visitor their own case study, each narrowing down to the benefit in the section. Each testimonial works as a link to another page, where the actual case study is presented in great detail including statistics and real data. Here’s the issue with this approach: designing, building and writing testimonials with all this infrastructure can take up time and effort. Here’s why we love Codecademy and included it in our list of testimonial examples. When you first get to the page, you see a video that contains testimonials from three alumni. 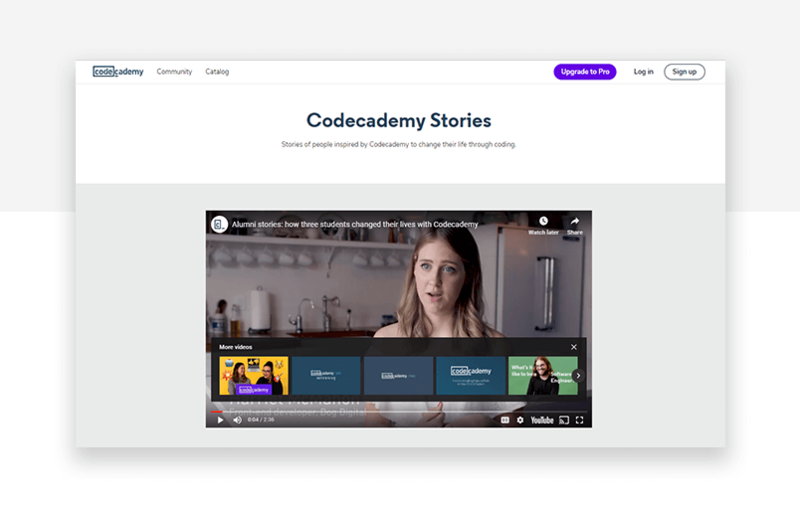 Each student goes into why they needed to learn code, and how Codecademy was able to help them reach their goals. The video makes it easy to convey emotion and all that comes with it. This enables visitors to identify with the ex-students in their search of success or happiness, and make a connection with the service the company offers. The initial video is slightly longer than average – reaching about two minutes and a half. This is a great testimonial example of a simple design that shines bright. With the photograph of the customer, visitors can have a sense of the real people that support the brand. 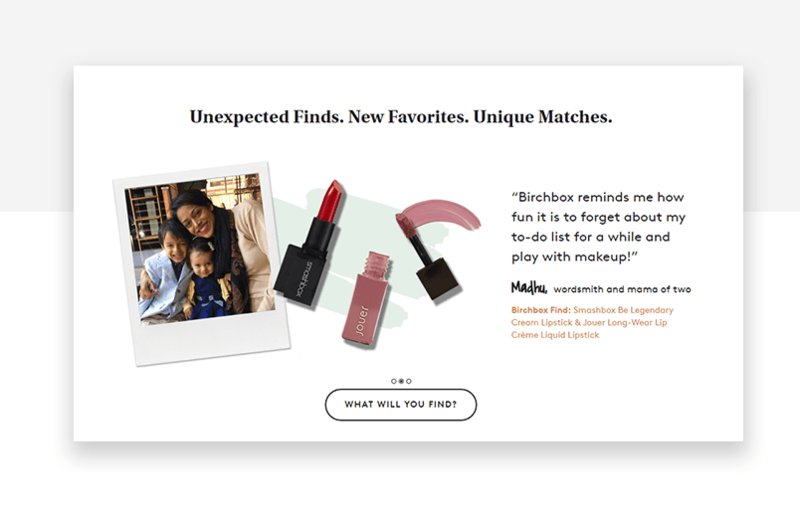 Having the real face of the customer opens the window of opportunity so visitors can relate to the customer, and their reasoning as to why BirchBox is a great service. 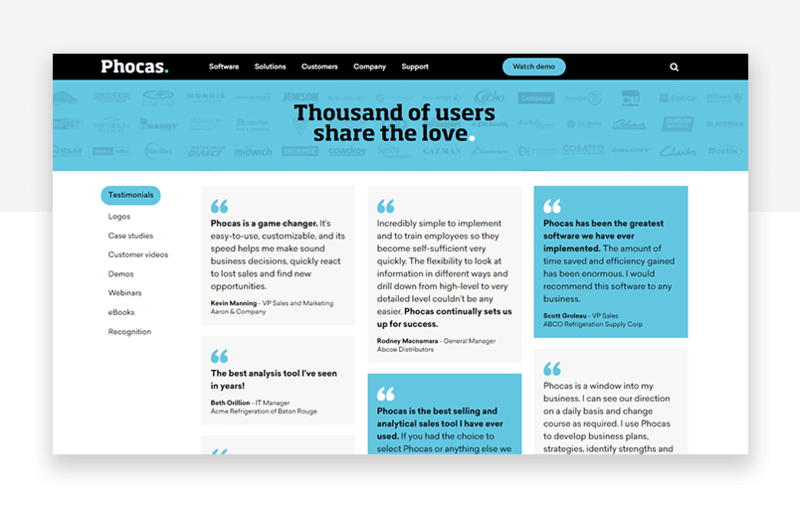 Phocas uses a simple grid design to showcase some of their best testimonials. It’s a classic move that still holds power – you lay down all the testimonials at the visitor’s feet and give them space to make their own opinion. The use of bold and blue to attract the eye is clever, as it serves as a way to summarize each testimonial in one short sentence. You’ll notice that Phocas also has a separate section with in-depth case studies should visitors want to know more about each testimonial. Slack takes full advantage of the fact that they have well-known brands among their clients, from just about any industry or sector. 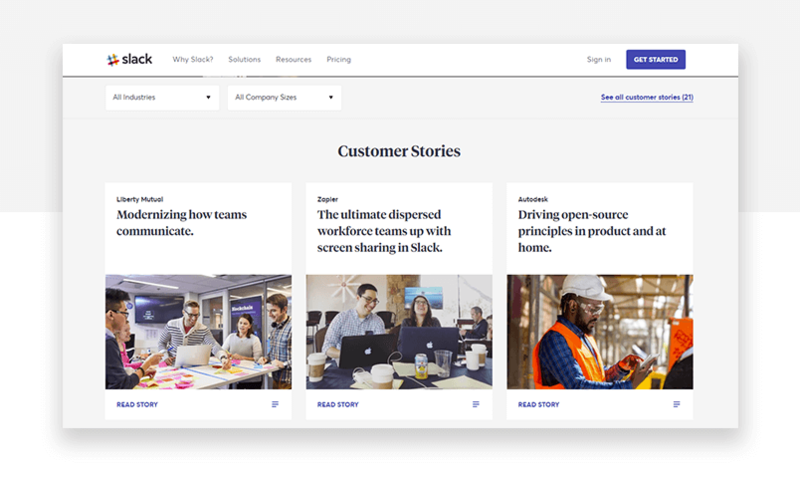 The visitor of their testimonials page is presented with a grid of links to case studies of clients, offering a more in-depth analysis of their communication challenges and Slack’s role in their success. Here’s why we love this testimonial example. 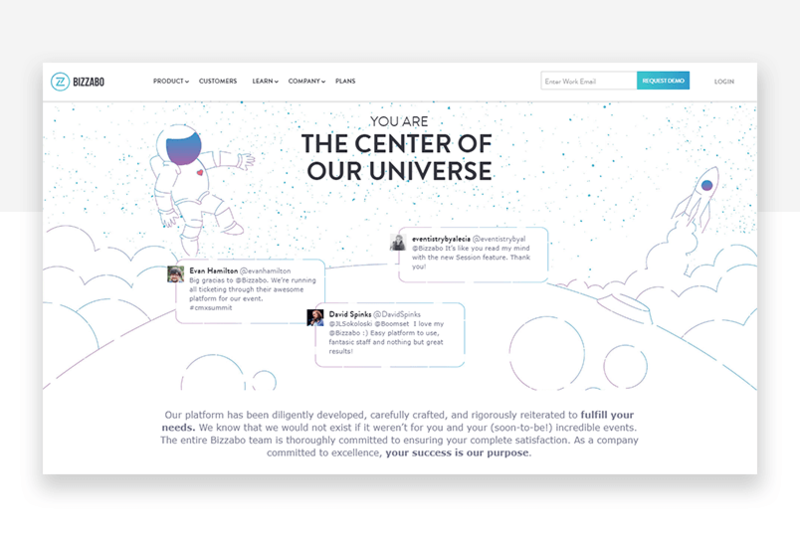 Slack was able to combine their big customers with the smaller ones, creating a testimonial page where there’s something for everyone. Regardless of whether your company is a large corporation or a fresh startup, you’ll find a testimonial that resonates with your challenges, and paints a picture of how Slack could help you too. 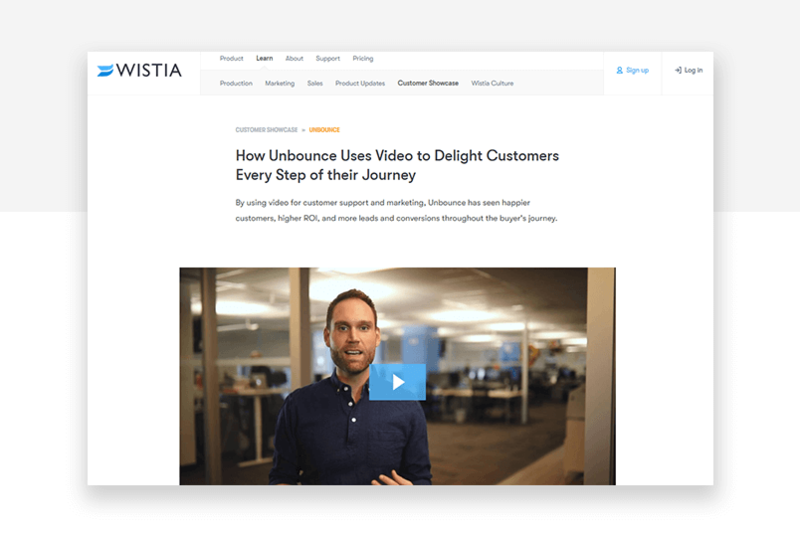 Wistia is smart in the way they present the testimonial case study from successful clients. Usually in a longer testimonial or a case study, dividing the information so that the reader can easily scan the whole page is a challenge. Wistia did not only that, but made it so that visitors can scan the content and take away the biggest arguments even without reading any of the paragraphs. Wistia distributed their content in videos, paragraphs and quotes so that visitors don’t need to read the whole thing in order to understand why Wistia was a force of good in their client’s trajectory. 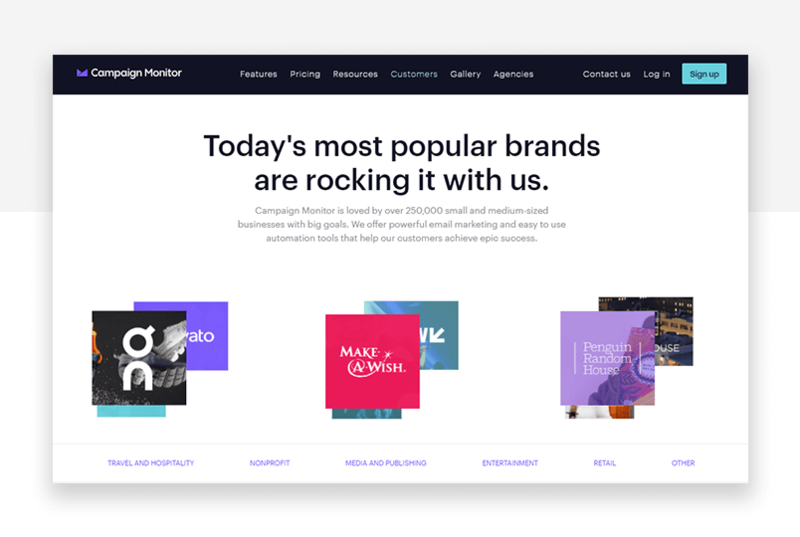 Campaign Monitor made it to the list of testimonial examples due to their clever way of dividing and presenting testimonials. Their clients range from hospitality to software businesses, so it was a great move to offer sections of the testimonial page according to the different industries they touch with their service. This way of separating the testimonials into industry categories works to encourage visitors to relate to the testimonials from their own industry. Surely, a testimonial from a fellow company in design would resonate more in comparison to that of a beauty retail company. Similar challenges are likely to pave the way for similar solutions – in this case, the use of Campaign Monitor. Bizzabo knows that great design speaks volumes. Their testimonial page is an example of how your creativity can place even more importance on the testimonials themselves. The center of our universe? How clever. The thing that stands out apart from the great use of illustration and copy, is the use of testimonials straight from social media. Platforms like Twitter are a great way to keep an eye on what people say about your brand, and can be powerful when used as social proof. Bizzabo also offers visitors several case studies on that same page. It’s the best of both worlds! This is a good testimonial example that users can take in without the danger of distraction. 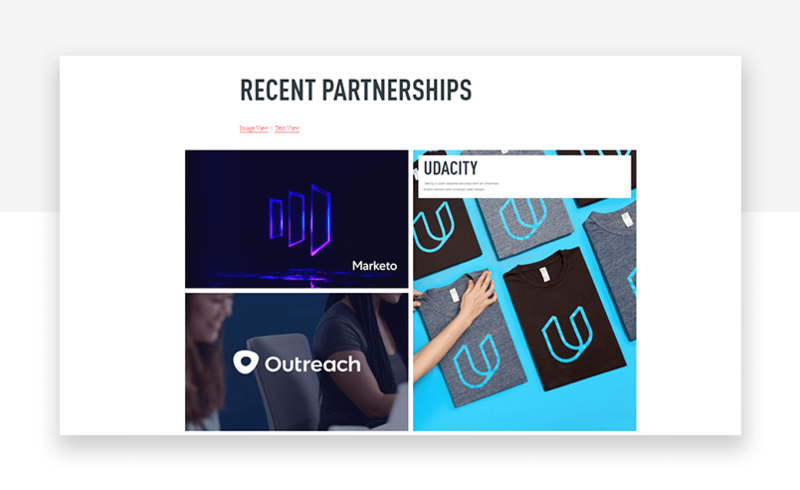 The testimonials page is a grid of images with each of them serving as a link to a full case study. The cool thing about this testimonial example is that the pictures are indicators of the brand that Focus Lab helped build on, and it is made so that when you hover the mouse above any picture you’re shown a brief description of the company and what industry it operates in. Much like Campaign Monitor’s testimonial example, visitors of all sorts can find a testimonial they relate to. The case studies are also well written and clearly present the problem each company faced when they became clients – followed by the tactics and features that helped them solve this problem. Simple, straightforward and effective. These testimonial examples go to show you that testimonials can vary in their impact depending on how you present them. You want a testimonial page that will allow the visitor to identify themselves with your customers, showing them that you’ve dealt with the same issues they face today during your career. You also want a testimonial display that allows for emotion and brand personality – make it yours by adding your own touch to the layout. Your testimonials can be large in the form of case studies or brief in tweets – the important thing is that they are genuine and paint a picture of what you’re like as a professional.